Get on a winner with walnuts! The ultimate healthy snack choice. Dr Joe Vinson, from the University of Scranton, analysed the antioxidant levels of nine different types of nuts and discovered that a handful of walnuts contained twice as many antioxidants as a handful of any other commonly eaten nut. Antioxidants are known to help protect the body against disease. Walnuts contain high amounts of long chain polyunsaturated (LCP) fats, which are crucial to optimise fat metabolism which is particularly helpful for people managing high cholesterol. They also have one of the highest concentrations of the plant source of omega 3 fat alpha-linolenic acid (ALA), which has anti-inflammatory properties and contributes to good heart health. A surprising finding that scientists are still researching, suggests the combination of fat, fibre and protein is effective at making us feel satisfied, so we eat less. So how many walnuts should you aim to eat each day? 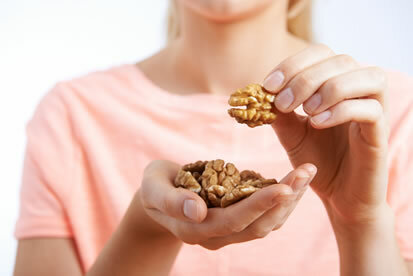 The research suggests that around 30 grams, or about 10 walnuts, is the ideal amount to reap the benefits. Use the afternoon slump to get your walnut intake. When you start to feel your concentration wavering, grab a walnut snack late in the afternoon. Walnuts help to ward off the pre-dinner munchies and the low carbohydrate content may assist in weight control. When you are next looking for a quick snack, forget the chips and head straight for the walnuts! Our Australian walnuts are available through Woolworths National Distribution sold in the Produce department, under Woolworths Select. Or you can get in touch with one of our wholesale & retail customers direct using our Stockist finder.